Almost 500 million pads are discarded into landfill every month! The problem does not end here. The plastic layer which is used to make it stain-free and the chemicals used in producing it get further transferred between soil, water and air, experts added. Affecting health directly on the user. Disposable feminine hygiene products contain chemicals and pesticides that aren’t good for your body. It’s uncertain what exactly they are because companies in the USA aren’t required to disclose ingredients. This is because pads and tampons are considered “medical devices.” Source: Huffington Post. The chemical cocktail content (dioxin, furan, pesticides and other endocrine disruptors) comes from the cotton used in them and the chemicals from the manufacturing process. Women's Voices for the Earth tested P&G's Always pads, it found the sanitary napkins emitted chemicals, like styrene, chloroethane and chloroform. The World Health Organization classifies styrene as a carcinogen. And the EPA says short-term exposure to high concentrations of chloromethane can have neurological effects. The Centers for Disease Control and Prevention says high levels of exposure to chloroethane can result in lack of muscle coordination and unconsciousness. However, all the levels are accapetable under federal regulations. 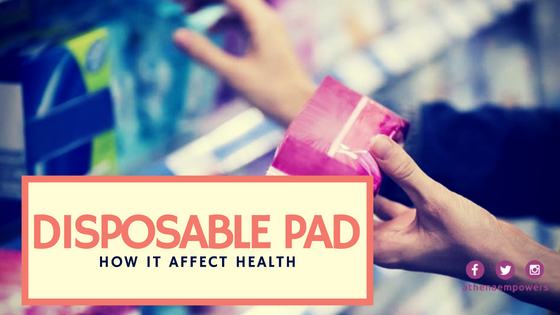 In a statement, Women's Voices for the Earth said, "While the levels of the toxic chemicals emitted by Always pads were relatively low, their presence warrants health concerns for women." You can alleviate this problem to some extent by using organic options, although these are more expensive.But only at the initial stage. Along the years you are saving more money and most importantly your health a less at risks and the environment are cared for.